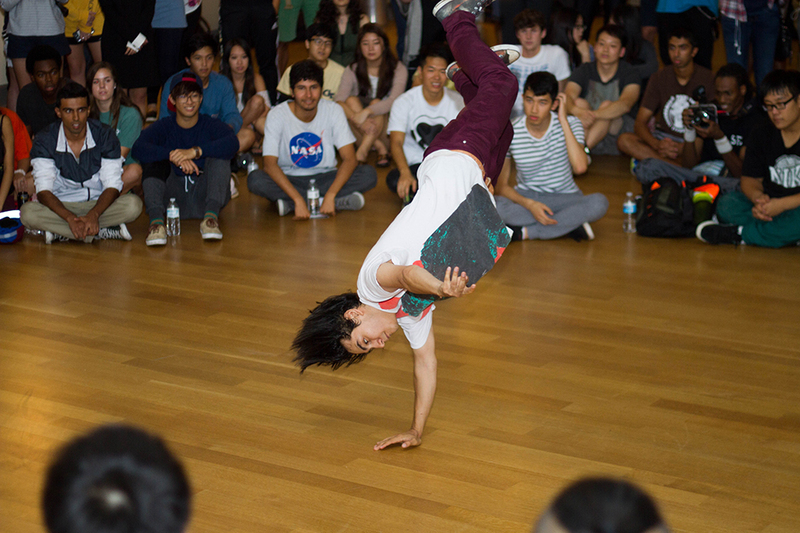 Last Thursday night, Sept. 17, Tekstyles, in the collaboration of BuzzBeats, hosted the Summit, a celebration of Hip Hop culture through music, dance and beat boxing. The Summit is a semesterly beat boxing and Hip Hop dancing event, which features one-on-one battles between contestants, in a direct elimination tournament. This semester, for the first time since its appearance on campus in Fall 2013, the event was scaled up and widely advertised, to the point that the SCPC decided to participate in its organization for the first time. Jeffrey K. Baucom, fourth-year CS major and President of the Tekstyles as well as founder of the event, describes this as one of the most important steps in the history of The Summit on campus, “The hardest thing was to implement the scaling of the event without changing its inherent nature, its casual atmosphere”. In order to achieve this goal, the event was held open-doors and completely free. The chosen location was the Student Center Ballroom rather than the usual room 220, also known as Under the Couch. For SCPC and the Summit, this was a huge improvement as the Ballroom can hold a greater amount of people and offers features that make the competition more interesting, such as parquet floor and better sound. Also, a joint committee formed by Tekstyles and BuzzBeats members offered a workshop for beginners in the half hour before the actual competition. On the far side of the large room, SCPC affiliates provided free popcorn and soft drinks to hungry spectators for the entire length of the event. Finally, for the first time in The Summit’s history, the winners of either competition would receive actual prizes: two tickets to Six Flags and a $25 gift card, plus some SCPC swag. All these perks, along with curiosity and genuine interest in hip-hop culture, attracted a good amount of spectators and by 7 p.m., the Ballroom was filled with a diverse crowd. In attendance were graduates and undergraduates from a variety of cultures and backgrounds. The group of competitors also represented a variety of ethnic groups. As Konstruct, one of the dancing judges, asserted, “Hip-hop culture promotes difference within integration: it pulls people together, but also sets them apart in their uniqueness of style”. Konstruct judges these types of competitions on a regular basis, but it was the first time he had ever judged at The Summit, called on by Baucom. He believes this event was of fundamental importance in order to spread the hip-hop culture on international campuses such as Tech. While waiting for the workshops to be over, the competitors began warming up. Tekstyles focused on stretching and practicing some moves, while BuzzBeats trained their voice for the upcoming challenge. At 7:30 p.m., the Master of Ceremonies, Gabe Auyeung, Tech alumnus and former member of Tekstyles, kicked-off the event by describing the rules of Preliminary rounds. Dancing rounds would be thirty seconds long, beatboxing rounds would last an entire minute and each competitor , in the first portion of the competition, performed alone. Auyeung reminded everyone of the prizes and started calling on the individual dancers to perform with the dynamic formula: “Let me get (name) on deck!”. A similar process brought the beatboxers to perform on “deck” one by one. Of course performers used artistic names and aliases such as Maniac, Yoshi, Dan the Man, GoYippy, Yappas, Grandmaster Thug Lord, ChoiceBeatz, and more. Many spectators who had never witnessed such a display of hip-hop were impressed just by watching the freestyle sessions. Brando de Courten, first-year ME, went so far as to declare “I’ve never seen so much talent in one room!” He agreed that events like this are extremely valuable in terms of increasing diversification on campus. The judges had some time to deliberate and chose eight beatboxers and 16 dancers who would stay for the actual battles. The time for each round at this point was extended and two competitors got on deck at the same time and faced each other. At the end of each battle the judges would be called on by the MC and would each point towards the competitor they liked the most. Ties were solved by “fighting” another round. “I like that there is interaction and friendly competition: they get along with each other,” said Garrick Larson, third-year CM, impressed with the competition. In fact, every time two competitors left the deck they’d shake hands and sometimes hug it out. As the competition approached the finals, the quality of the performances rose incredibly fast. In the final round for beatboxing SpitFire and Doc faced each other, while in the final dancing battle Hermes and Maniac “fought” intensely. Amazing beats and impressive steps earned SpitFire and Hermes their well-deserved victories. Neither of the winners is a student at Tech, but that only adds value to this event. SCPC Arts & Culture Chair, Annie Son, points out, “The Summit is one of the most diverse events Tech and the fact that we can involve lots of students from outside of campus’ boundaries proves it.” Son is convinced that hip-hop is “very undervalued at Tech” and that events like The Summit work well to spread awareness across campus. She observed that although she enjoyed it, SCPC will probably not partner with Tekstyles and BuzzBeats next semester, because it is constantly varying scope of action. This event revealed that Tech students are not only great at using technology and intellect, but are also inclined to make the best of our physical capabilities. The next big hip-hop event will be held at SouthBound, organized by Tekstyles in November.